Electrolysis is a method of removing individual hair from the face or body. Electrolysis hair removal has been around since 1875, and is an FDA approved permanent hair removal process. 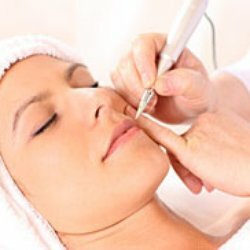 The Electrolysis procedure is done by a trained Electrologist who inserts a probe in the hair follicle and releases a current which destroys the papilla preventing future growth. 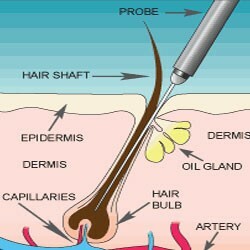 We use state-of-the-art equipment, providing the most efficient process to destroy the growth of the hair. During consultation the most effective process would be determined for the most successful results. Most areas of the body can be treated with electrolysis hair removal, including the eyebrows, face, Chin, Upperlip, arms, abdomen, bikini, and legs. Electrolysis does require mutliple treatments, depending on the hair (how long it has been being treated, what treatments that have been used, and also the coarseness of the hair). Most people describe the feeling as that similar to hair being tweezed. Your own sensitivity will determine your tolerance level. With the advanced equipment used at the clinic, the least amount of discomfort will be experienced. It is also a good idea to avoid caffeine the day of the treatment, it tends to cause a little more sensitivity due to “waking up” the nerves. Avoid Waxing, tweezing or plucking! Avoid Deodorants or creams before coming in for treatment.